While most drivers are aware of the importance of getting their vehicle checked out after an accident, not everyone knows how to listen to their car under normal conditions. It can be difficult to tell the difference between a tired car and one that needs to be looked at by a professional. Early detection is often the key with vehicle issues. Problems that are left too long can result in costly fixes, or maybe even a complete vehicle breakdown. The following tips will help you know when it’s time to visit an auto body shop. Perhaps the most obvious clue, if you see a light pop up on your dashboard, it’s probably time to see a mechanic. While most of these indicator lights are for smaller issues, such a burnt out tail light, some indicate large issues that need to be addressed immediately. One warning light to familiarize yourself with is your check engine light. If this light becomes illuminated, it means that there is something wrong with any of the hundreds of systems that your car’s computer monitors. While not a huge cause for panic, you should get your engine looked at sooner than later. However, if you ever see your check engine light start flashing on your dashboard, you need to get it to a mechanic as soon as possible. A flashing light can mean there is an issue with your emissions system, which can damage the catalytic converter if you continue to drive without getting the issue repaired. No one is more familiar with your vehicle than you. Oftentimes the first clue your car gives you that something is wrong comes in the way of an unusual sound, so it’s incredibly important to listen to your vehicle. If you hear any of the following sounds, it’s time to schedule your next auto body appointment. If you notice an irritating screeching or squealing noise when you press on the brakes, it most likely means it’s time for some new brake pads. Any sort of loud bank, knock or clunk that happens after you turn off your car often points to an engine backfire issue. Engine backfires happen for a number of reasons, including fuel imbalance, valve malfunction, or a damaged spark plug. A squealing or whining sound coming from under the hood of your car is letting you know that there is an issue with your drive belt. It may be cracked or worn and requires the help of a professional. Because the drive belt is responsible for providing power to the alternator, powering steering and more, failing to address these sounds will only make things worse. If you can feel and hear shaking or rattling coming from the back of your car, it’s time to get your exhaust system checked. The exhaust system is a network of pipes that leads harmful gasses away from the engine via the muffler. If any of these pipes becomes loose, you’ll probably be able to feel or hear it rattling out of place. 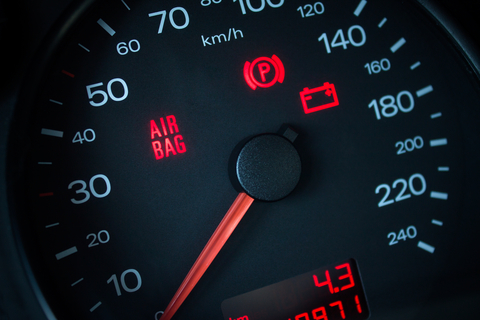 Hearing a ticking noise from under the hood of your car should be a signal to you to get our oil topped up, stat! Whether the loss of oil is due to a leak in the system or you not keeping up with regular oil changes, it’s critical to address the issue to save your engine’s life. Your vehicle should never have any sort of smoke or steam coming out from under your hood. White steam is usually a sign that your vehicle is overheating, meaning that you may have an issue with your radiator. Continuing to drive your vehicle in this condition could severely damage your engine. Excessive smoke being pumped out of your exhaust pipe is also a major sign your car is in need of a tune up. During the transition to cold winter months, it’s normal to notice slightly more white smoke coming out of your exhaust when you first start your vehicle. This is a normal reaction and should subside once the engine warms up. However, if you notice excessive smoke coming from the exhaust while driving, or if you can see a build up of black residue around the exhaust pipe, it might be an indication that you have an oil leak. Be sure to take your vehicle in to a reliable auto body shop right away. If you notice that your car isn’t accelerating as quickly as you used to be able to, or if you feel dramatic “surges” in engine power, it’s worth it to pay a visit to your mechanic. These are two common symptoms of transmission issues. Your transmission is what helps you change gears, either manually or automatically. It’s plays a critical role in your car’s power, and as such, issues with your transmission should not be taken lightly. Vibrations or pulling during driving can signal a few different issues – all of them important to the safety of your vehicle. You might have unbalanced tires, a flat tire, or maybe your brake pads have been worn down. All of these problems can cause major safety concerns for you as the driver, so it’s important to get your vehicle serviced as soon as you can. The most common way leaks are discovered is seeing a puddle of liquid on the ground where you park your car. A leak, especially in conjunction with any of the other issues discussed above, warrants a visit to an auto body shop. Water – if you notice water water your car during the summer months, there’s no need to worry. This is just a result from running the air conditioning. If you notice your vehicle running differently than it normally does, it’s time to contact the team at Freeway Auto Body. We can diagnose your problem and provide you with straightforward solutions that will have your vehicle back up and running in no time. Call or visit us today to make an appointment.